After doing more than 150 Random Roles for The A.V. Club, it would be nearly impossible for me to look back at the interviews I’ve conducted for the feature and narrow it down to my single favorite conversation. I can, however, tell you—and without so much as a moment’s hesitation—the most profound relationship I’ve ever had with someone I’ve interviewed for Random Roles. Although he posed this question in an email, I swear to you, I could hear his voice in my head just as clear as day, and I’m guessing there’s a pretty good chance that you heard it when you were reading it, too. 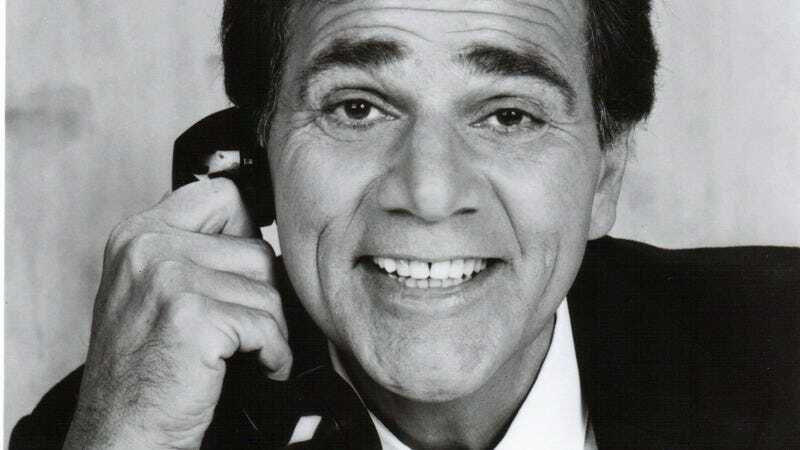 That’s the kind of voice Alex Rocco had: instantly memorable and completely unforgettable. As I soon discovered, that’s exactly the kind of guy he was, too. After another email and a few phone calls, it was decided that I’d have a proper sit-down with Rocco when I came to Los Angeles for the Television Critics Association press tour. The specifics of the meet-up were very much scheduled on the fly, to the point where we only confirmed the date of our meeting a few hours before it actually took place. Being a stranger in a strange land without a rental car, I took a cab from my hotel to Rocco’s residence, where I was greeted warmly by his wife, Shannon. She and I chatted for a few minutes in their living room while we waited for the man himself to emerge (during which time I couldn’t help but giddily notice his Emmy for The Famous Teddy Z sitting on a nearby shelf), and during the chat, what I experienced was, for lack of a better phrase, the sweetest possible grilling a guy could get. But it made perfect sense: wouldn’t you want to know as much as possible about the person who might be helping your significant other write his memoir? When Rocco came out, he immediately enveloped me in a hug, wanting to make sure that Shannon had been taking care of me, asking about my family and demanding to know every little detail of my time in California thus far. After an appropriate amount of chit-chat, we got down to the business at hand. The conversation was all very casual. Serious, yes, but it was still just a couple of folks chatting… or, more specifically, he was talking, and I was soaking it all in. He told me what he’d been thinking about for the book, what parts of his life and times he wanted to discuss, what skeletons he was toying with unearthing, and this, that, and the other. He and Shannon spoke openly, I listened intently, and then we had a back-and-forth about what they envisioned and what I envisioned. When we wrapped up, they refused to let me take a cab back to the hotel, so after taking a picture with Rocco, who made sure that I had a signed photo of him from The Godfather to take home, Shannon drove me back to my temporary place of residence. The whole experience was surreal, but wonderfully so, and no matter what might happen from there, I knew I’d still have a souvenir from the experience that I’d treasure forever. A month or so passed after that in-person encounter, and I tried not to be overanxious about the fact that I hadn’t heard anything, but when Rocco turned up on an episode of Private Practice, I used it as an excuse to send him a text and congratulate him his performance. He wrote me back to thank me, but that was the extent of the conversation, and while I had no reason to believe that I’d said or done anything during my visit to turn him off of the idea of collaborating with me, the silence—which continued for another two months—was killing me. Finally, Rocco decided in early 2013 that, yes, he wanted to at least start taking some baby steps with the book, if only to see how well the two of us could work together. When we talked, Rocco regaled me with stories that he envisioned being in the book as well as stories that he didn’t want in the book but that he just wanted to tell me. At one point during this period, he auditioned for a small role on a prime-time sitcom, and he asked me what I knew about the show and if I thought it was funny. As you might imagine with that glorious voice, everything he had to say seemed worth hearing, and every story seemed absolutely amazing at the time he was telling it. Better yet, when the time came to sit down and transcribe them, most of them played out just as well on the page. You’ve probably deduced by this point that the book did not come to pass, which—if I’m to be perfectly honest—remains one of the biggest disappointments of my life, but I can take comfort in the knowledge that it wasn’t because Rocco and I didn’t work well together. Ultimately, things began to fall apart because I took one of his stories and made it play a little too well on the page. It was so unexpected that I found myself stammering and all but crying out, “I don’t know what I did wrong, but I can change!” But he didn’t want to fix anything, and he didn’t even really want to try to explain why things weren’t working out. He just wanted to break up. And having done so, he asked me to give his love to my wife and daughter, and then he said goodbye. Rocco was certainly well within his rights to step away and call it quits: We’d signed no contract, and it was established up front that we were simply feeling each other out as collaborators. He’d seemed so happy with my efforts as a writer, though, that I just couldn’t comprehend why this had happened so abruptly. I sent Shannon an email a few days later, asking if she could shed some light on exactly what had happened, which she did to the best of her ability, but the long and the short of it is that the story that I was most skilled at telling was no longer the story that he was most interested in telling. And that’s fair enough. But it still broke my heart, and since I knew I wasn’t going to be able to change his mind, I just didn’t have anything else to say to him. The last time I had any communication with Rocco was immediately after the Facts Of Life oral history debuted. After he read it, he sent me a message saying, “Great stuff. Loved it. You’re very talented. Love to your family.” I wrote back, thanking him, telling him to give my love to Shannon, and—just because it felt right—I added, “You know, my wife said that she’s still holding you to that home-cooked Italian dinner you promised her the next time she’s in L.A.” His response: “Done deal,” followed by a smiley face. Of course, because of the language, I probably won’t tell her most of them till she’s 18. But you’d better believe they’re worth the wait.